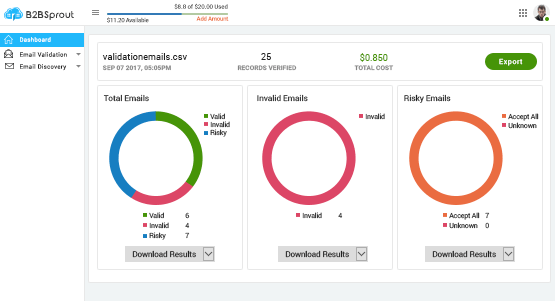 Verify & Validate Email Addresses #1 Tool to eliminate hard bounces and improve email deliverability. Validate, verify and segregate between good and bad email addresses to reach the real inboxes. Check the deliverability of email addresses now! Verify email addresses in bulk. Signup Here. Maintain a clean mailing list and remove undeliverable, bounced emails even before sending campaigns because all major ISP mail servers block a sender's email domain for repeatedly sending messages to non-existing email addresses. Email verifier keeps your list clean, reduce bounce rate by upto 99% and ensure you reach the right mailboxes and real prospects. 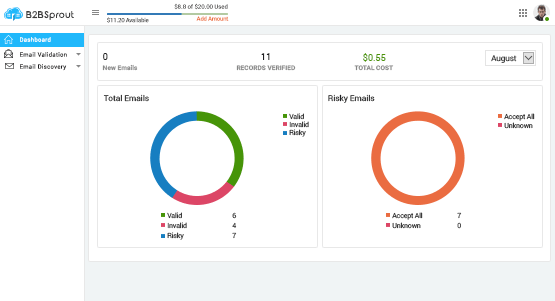 Safely import your email list for verification under your account and email verifier will calculate the email cleansing cost. Post payment, the system will cleanse the email list and present the download link. Simple yet effictive pricing automatically calculates the costs and emails you when you list is ready for download. Using Real-Time API helps to prevent bad email addresses from entering your systems in the first place. Email validations are never 100% accurate, still we can guarantee that more than 95% of deliverable email addresses won't bounce. How do you count email verification requests? Each verification is counted as one request. Free accounts are limited to use 10 requests a day. Please add credit to your account to verify more. Can I verify Gmail, Yahoo, HotMail addresses too? Yes, you can verify webmails addresses such as gmail.com, hotmail.com, yahoo.com, etc. but it requires double credits for generic email validation.